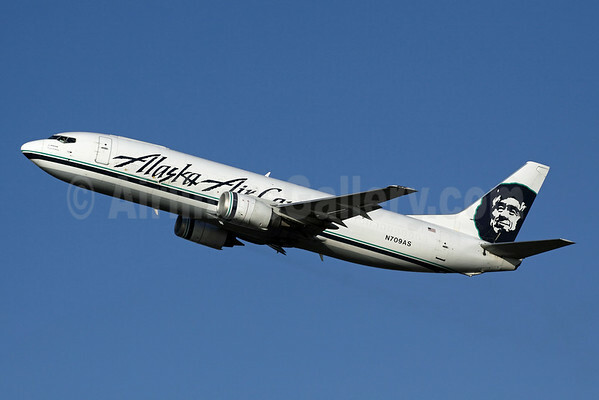 Alaska Air Cargo (Alaska Airlines) (Seattle/Tacoma) today (May 16) delivered 24,100 pounds of the season’s first shipment of Alaska Copper River salmon to Seattle-Tacoma International Airport. The arrival of the fish-filled Boeing 737 marks the start of the summer salmon season and is an annual rite of passage anticipated by seafood lovers throughout the Pacific Northwest. At least five more Alaska Airlines flights today will transport salmon from Cordova, Alaska, to Anchorage, Seattle and throughout the United States. The flights will have fresh fish from three Alaska seafood processors: Copper River Seafoods, Ocean Beauty Seafoods and Trident Seafoods. Alaska Airlines plays a significant role in supporting the Alaska seafood industry, which is recognized worldwide for its sustainable fishing practices. Last year, the carrier flew more than 24.5 million pounds of fresh Alaska seafood to the Lower 48 states and beyond, including 1 million pounds of Copper River salmon. Following the arrival of the first fish, three Seattle-area top chefs — John Howie, owner of Seastar, Jason Franey of Canlis and Ethan Stowell, owner of Tavolata — will compete for the best salmon recipe in Alaska Air Cargo’s fifth annual Copper Chef Cook-off. The chefs will have 30 minutes to prepare and serve the first catch of the season to a panel of judges, which include Seahawks place kicker Steven Hauschka; Jay Buhner, Seattle Mariners Hall of Famer; and Ben Minicucci, Alaska Airlines’ chief operating officer. The airline will announce the winner of the cook-off on Twitter @AlaskaAir. Fish lovers can follow the competition and share their favorite salmon recipes on Facebook, Twitter and Instagram using the hashtag #SalmonChef. Among the onlookers awaiting the arrival of the first fish were 10 Alaska Airlines Mileage Plan MVP Gold members, and representatives from USO Northwest, the U.S. Marines and U.S. Coast Guard, who were invited to sample the season’s first Copper River salmon. Farther north, Copper River Seafoods and local Anchorage-area restaurants are also welcoming the arrival of Copper River salmon with festivities planned at Alaska Air Cargo at Ted Stevens Anchorage International Airport. Later this afternoon, the seafood company will deliver a ceremonial first fish to seven downtown Anchorage restaurants. Copper River salmon shipped on Alaska Air Cargo arrives as fresh as possible to grocery stores and restaurants across the nation, thanks in part to a cool chain training program required of all airline employees who handle perishables. Alaska Air Cargo employees are required to adhere to strict seafood quality standards and pass an annual food quality course. The first Copper River salmon was brought to SEA with their Boeing 737-400 Combi N765AS. In other news, Alaska Airlines was awarded its seventh J. D. Power award as the best traditional network carrier. Top Copyright Photo: Mark Durbin/AirlinersGallery.com. 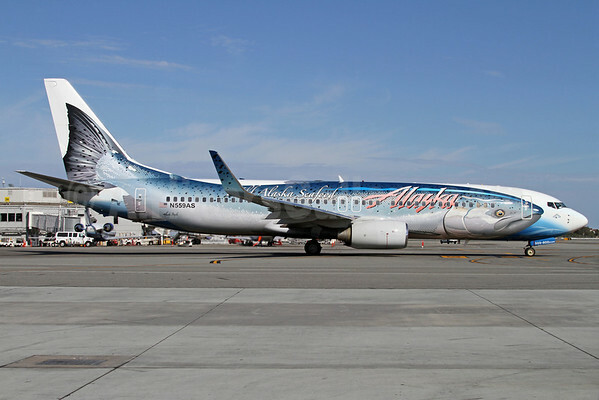 Beautifully displayed, Boeing 737-890 N559AS (msn 35178) is the second Alaska 737 to wear the special “Salmon-Thirty-Salmon” livery in support of the Alaska fisheries industry. Bottom Copyright Photo: Michael B. Ing/AirlinersGallery.com. Dedicated as a freighter, Boeing 737-490 (F) N709AS (msn 28896) climbs away from the runway at Ted Stevens Anchorage International Airport (ANC). This entry was posted in Alaska Air Cargo, Alaska Airlines and tagged 28896, 35178, 737, 737-400, 737-400F, 737-490, 737-800, 737-890, Alaska, Alaska Air Cargo, Alaska Airlines, Alaska seafood, ANC, Anchorage, anchorage international airport, Boeing, Boeing 737, Boeing 737-400, Boeing 737-400F, Boeing 737-800, Copper River salmon, Copper River Seafoods, Cordova, N559AS, N709AS, Salmon, Salmon-Thirty-Salmon, San Francisco, SEA, seattle tacoma international airport, Seattle/Tacoma, SFO, Wild Alaska Seafood on May 16, 2014 by Bruce Drum.